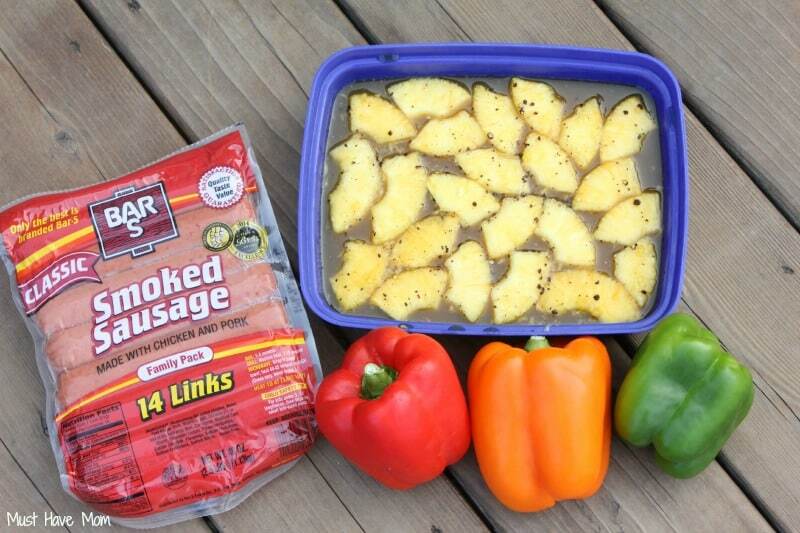 Grilled Pineapple, Pork & Sausage Kabobs Marinade Recipe! 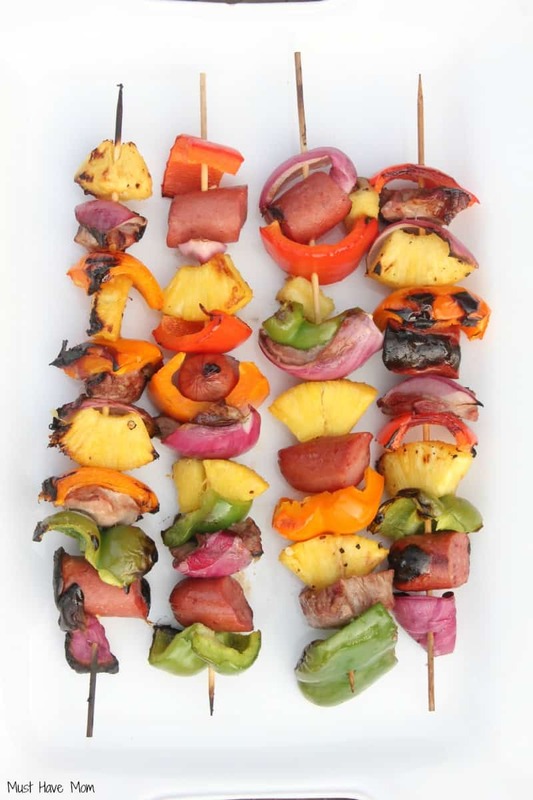 Grilled Pineapple, Pork & Sausage Kabobs With Kabobs Marinade Recipe! Looking for an amazing dish that will wow the crowd without all the work? This is the perfect dish for your next backyard BBQ and it’s a keeper. Often times in the Summer we take advantage of the longer days and play outside all evening before realizing it is late and we haven’t eaten dinner yet. This is the perfect dish to throw together and have on the table in thirty minutes or less. 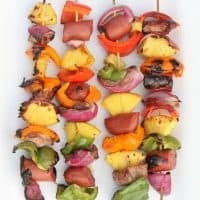 You won’t be sacrificing flavor or presentation though with these crowd pleasing Pineapple, Pork & Sausage Kabobs with a sweet pepper marinade. 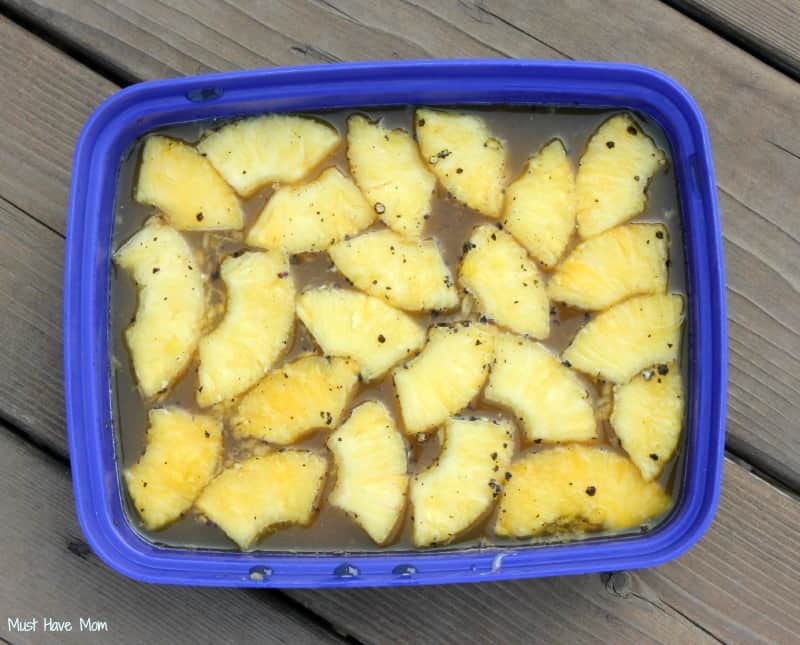 First mix up your marinade and get the pineapple marinating for 20 minutes. For the kabobs marinade recipe mix together: 3/4 Cup orange juice, 2 Tbsp raw honey, 1/2 Cup brown sugar and grind in some peppercorns from a peppercorn mill. I used local raw honey and it is so much better than store bought honey. If you haven’t tried it then you are missing out. It’s completely different than the honey bear you buy in the store. It’s amazing and not overly sweet. It has a great flavor. While your pineapple is marinating you can soak your skewers in water for ten minutes. This helps prevent them from burning on the grill. Then begin chopping your meat and vegetables into 1″ x 1″ pieces. Once your pineapple has finished marinating you can assemble your skewers. I kept veggies on each side of my pineapple so the raw meat wouldn’t be next to it. Be sure to save your leftover marinade after removing your pineapple as you will brush it on while grilling. Then put your kabobs on the grill and grill over medium heat (direct) for 6-8 minutes then turn and grill an additional 6-8 minutes until meat is cooked. In the last few minutes of grilling brush with marinade. These were the perfect meal to throw together at the end of a very busy day. They tasted amazing and they landed on our list of “must make again” recipes. I served them with brown rice and they paired nicely together! You can enter the 100 Day of Summer Sweepstakes on the Bar-S Facebook page! Print off the recipe here or pin for easy finding later! 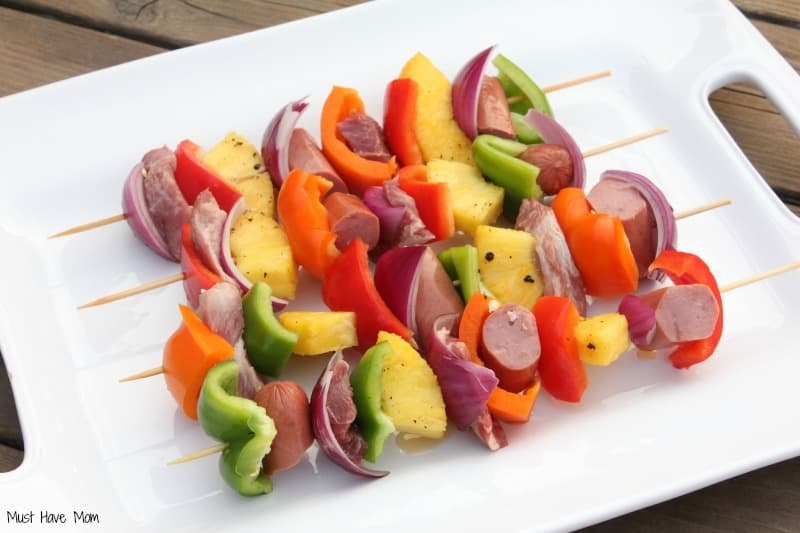 Grilled Pineapple, Pork & Sausage Kabobs With Marinade Recipe! 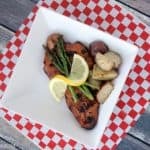 Easy Summer grilling recipe that uses fresh ingredients and will wow the crowd! Mix together orange juice, raw honey, brown sugar and pepper to create the marinade. Marinate pineapple chunks in marinade for 20 minutes. Soak skewers in water for 10 minutes to prevent them from burning. 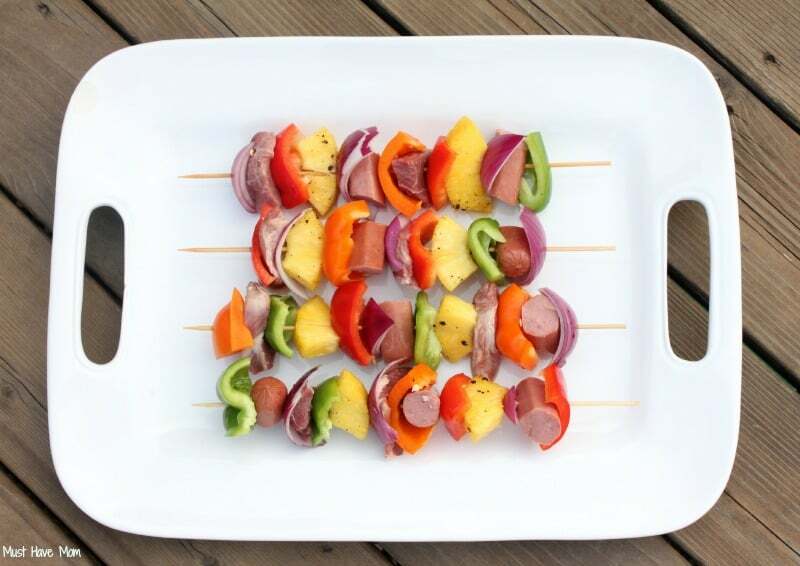 Assemble skewers using pineapple, sausages, pork, onion and peppers, rotating them as you go. Put veggies on either side of the pineapple to keep the raw meat juice from getting on the pineapple. Grill over direct, medium heat for 6-8 minutes then turn and grill an additional 6-8 minutes until pork is cooked through. During last few minutes of grilling brush on marinade. How To Make A “Minnesota Dog”! 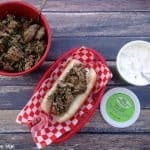 Minnesota Hot Dog Recipe! 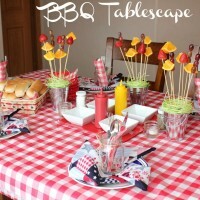 Host The Ultimate BBQ Party: BBQ Party Ideas, Tablescape & Grilling Recipes! « Rio 2 Review & Giveaway + Our Road Trip Getaway! Oh these look amazing! Now I really want some Pineapple! 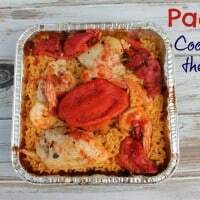 Going to have to make this next week for dinner. The moment you added the pineapple, I was sold. I love that on my kabobs! LOVE grilled pineapple!! It makes any dish so much better! Thanks for the recipe! I will be passing this along! These look fabulous! 🙂 I’d grill year-round if we didn’t live in the Midwest. 🙂 Thanks for sharing! Yum! i LOVE GRILLED PINEAPPLE! 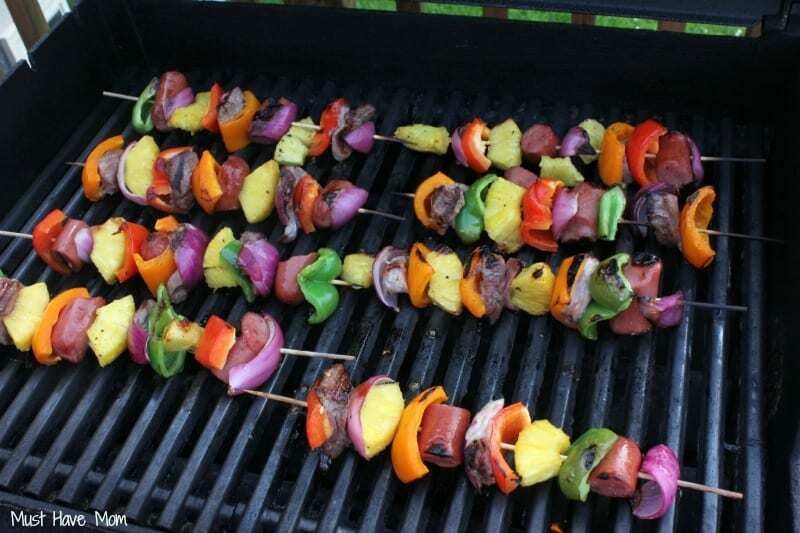 aND KABObs YUM! Such an easy and inexpensive dinner! Totally putting this on my dinner menu for the kids next week. I’m sure those would be a big hit! I love how colorful they are! The family would love these! 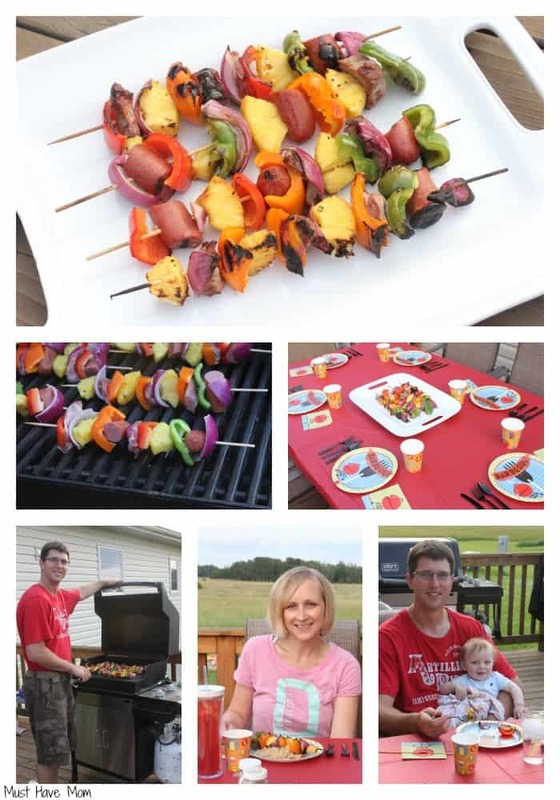 Grilled pineapple and kabobs are two of my favorite summer grilling foods! Feed me, seymour! These look AMAZIIIIING! The addition of pineapple is FANTASTIC! Those look so good. Wow, those ka-bobs looks so colorful. I would love to make them on our grill. You can’t go wrong with grilled pineapple! 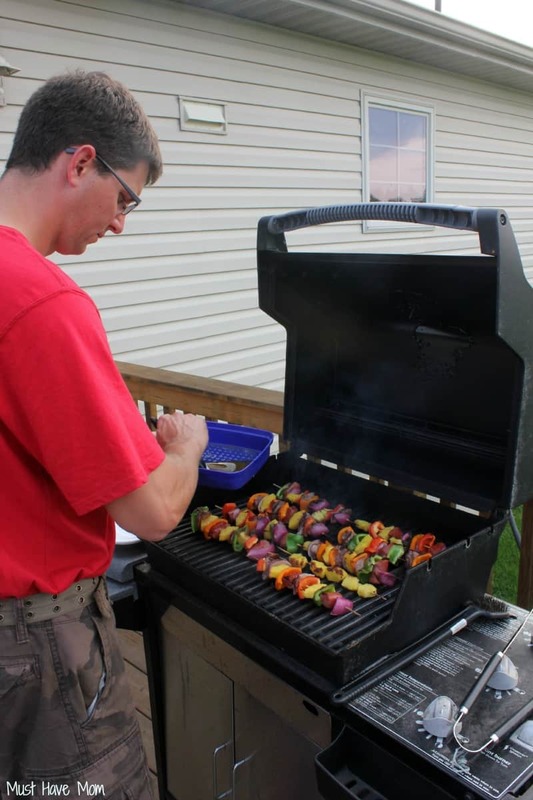 Kabobs on the grill are one of my favorite things to eat. I bet they are fabulous with the marinade. These look absolutely yummy! I would never have thought to combine all these together on a kabob. I love how easy they are to do. These look delish! I will have to check them out this weekend when we fire the grill up. Yum, this looks so good! I’ve never tried sausage and pineapple but this post makes me want to! I like your recipe tor the marinade mix too. thanks for sharing!